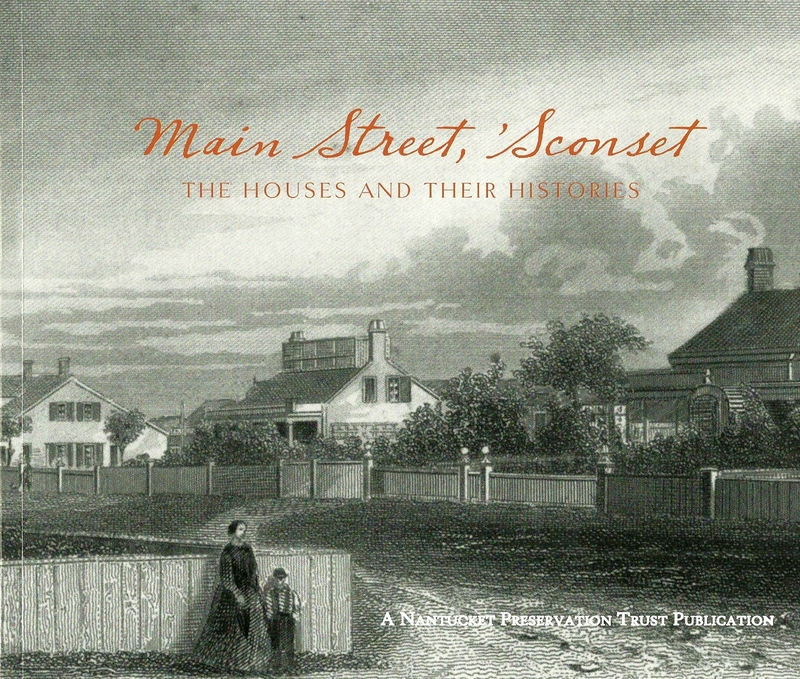 The Nantucket Preservation Trust is pleased to announce the completion of its independent study on best practices for the historic district commission. Undertaken this winter and early spring, the report provides general background on HDC policies and identifies key best practices for Nantucket to consider. The NPT hopes this study will be used as a starting point to assist the HDC in their work and the work of a committee charged with recommending improved procedures. We encourage discussion and further review of HDC practices and look forward to changes that will lead to better protection of our architectural heritage. 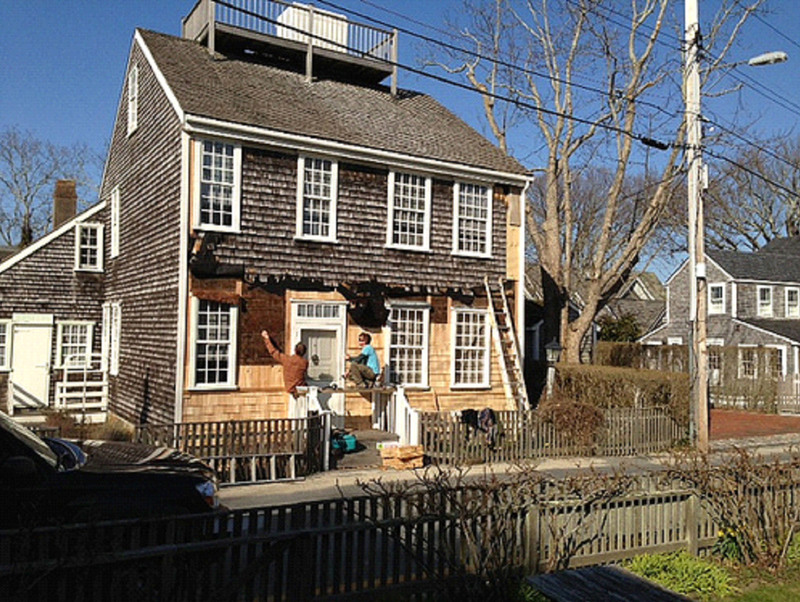 With the support of grants, the Mitchell House’s southern façade has been re-shingled. The old shingles were no longer sufficient to protect the Mitchell House from weather. The shingles had shrunk, curled, and left significant gaps between one another courtesy of sun, rain, and age. This can allow water to penetrate to the sheathing and cause rot and leaks. They were last replaced circa 1960. 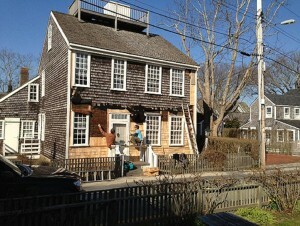 The Mitchell House contracted with Nathan Killeen of Nathan Killen Old House Restoration to do the work. Nathan has worked on the Mitchell House for many years with Sanford Kendall who is now retiring. Over the course of two weeks, with carpenter Matt Anderson, Killeen stripped the shingles by sections at a time. There was minor sheathing rot at the base of the House so these parts were replaced in-kind with older, non-pressure treated wood. Some sill rot was also discovered and a piece of wood was sistered to the old sill once the rot was cleared away. The original sill just needed some strengthening. Wood splines were placed along the corner boards, as well as around the windows and front door. This will keep water from penetrating. Tar paper was not used as this is not historically appropriate and also acts as a vapor barrier – trapping moisture in the House and sheathing. We think based on nail holes, that this is only the third time the façade of Mitchell House has ever been re-shingled. The sheathing and corner boards, as well as the trim for the windows is original – and the sashes and door are too, of course! We also found carpenters’ marks, sawyer’s marks from when the wood was cut, and even better – shavings from the carpenters when they built the house in 1790! These were stuck between the sheathing and the interior wall in the space that exists. 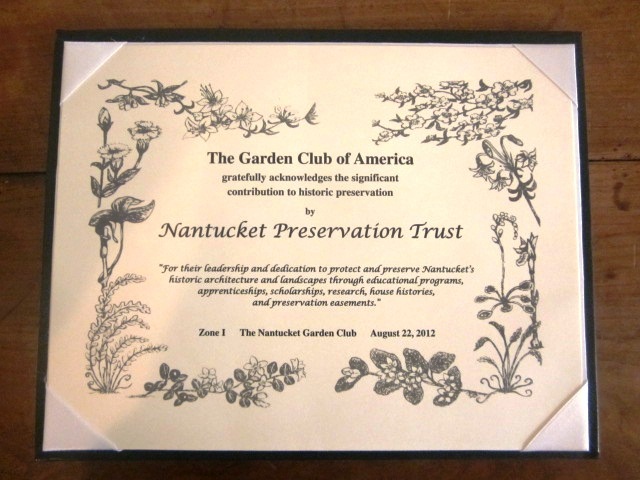 Preservation Awards honor projects, individuals and organizations that have made a positive impact in preserving Nantucket’s historic character. It is our hope that the awards will continue to encourage proper preservation work, broaden outreach to the building community, and ensure the protection of the island’s historic resources. If you know of an individual or organization that you feel qualifies for one of the following award categories, please nominate them! Be sure to include nominee’s name, location of project and how it supports preservation on the island. Deadline for nominations is March 8th. Awards will be announced during Preservation Month in late May, with an awards ceremony to follow on June 20th. The John A. and Katherine Lodge Stewardship Award recognizes an individual, organization or owner(s) of historic property who demonstrate a high degree of commitment to the preservation of the structure(s) and the island. 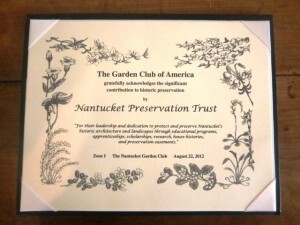 An individual who maintains an historic property or who has played an important part in the preservation of Nantucket also can be nominated for this award. New Walking Tour App Debuts! The Nantucket Preservation Trust now makes it possible for you to explore the rich history and architectural heritage of one of the most celebrated streets in America – at your own pace! “A Walk Down Main Street” self-guiding walking tour app is now available for use on any Apple iOS device. This tour highlights the histories and architecture of 30 houses between the Pacific National Bank and the Soldiers & Sailors Monument and reveals the story of Nantucket’s whaling prosperity, decline and rebirth. Go to the Apple App Store and download Locacious (free). Locacious will ask to use your current location and a map will be displayed, showing where you are. Look under the tabs marked “featured” or “new” for the three chapters listed below. Tap the tour name and follow the directions from the screen. Your feedback is valuable to us! Please email your suggestions and in return, receive a free copy of the book “A Walk Down Main Street” (include your mailing address for book). Annual Meeting to be held Friday, July 27th at 11am. Meeting will be at the First Congregational Church, Old North Vestry at 62 Centre Street. Marty will discuss the exciting 3D laser technology for documenting historic Nantucket. This technology offer opportunities to document historic buildings and places more rapidly and accurately. Through a cooperative agreement with Lund University in Sweden, PI:N and the University of Florida has explored the use of 3D laser technology as a tool for capturing the physical attributes and conditions of heritage sites. As demonstrated by Lund University and others, this type of documentation has proven invaluable in quickly creating a historic record, diagnosing problems, and developing interventions, solutions, and plans for preserving historic structures and sites. 2012 August Fete, Aug 9th at 8:15 pm. Though there is widespread community support to continue the fight to save Martins Lane, the Nantucket Board of Selectmen voted before last night’s meeting not to appeal the recent Superior Court ruling, thereby making the installation of a driveway on the historic byway one step closer. The decision by the majority of the Board of Selectmen to abandon the fight to protect Martins Lane is disappointing in several ways. More than 790 people signed an NPT petition asking the BOS to appeal the Superior Court’s flawed and unfortunate ruling, but the board refused to allow any discussion or public comment on the matter. The board majority also prevented individual selectmen from stating how they voted, or explaining their position to the public. Unique historic resources like Martins Lane are too important to give up on. Nantucket loses a piece of its soul every time we allow something that makes this island special to be destroyed for personal gain. We believe the Historic District Commission’s role is to serve as the public guardian of the history and sense of place that separates Nantucket from the rest, and we believe their decision in this matter was the correct one. We thank the HDC for its often thankless work, and we urge our selectmen to join us to help protect Nantucket’s irreplaceable history and to find a preservation-minded solution to this important matter. Rest assured, the NPT will continue its efforts to protect Martins Lane, and we know we can count on you to help.